Size: Length 250cm/ 98.4Inch(when it is straightened); Diameter: 3.0 cm / 1.18 inch. Perfect size for Senegal parrot, Sun Conure, Small Cockatoos, Green Cheek Conure and Mini Macaws. 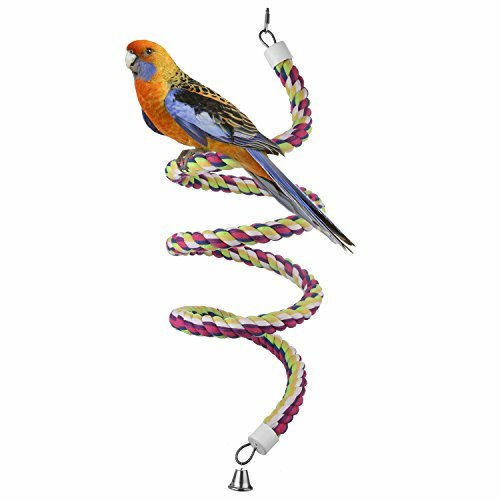 Bungees promote and help to develop birds' coordination and balance skill. You can hang it in the birdcage, birds can climb up and down to strong its muscle, chewing it to clear tooth and keep its beak healthy. Attention: If you want to put this toy into a cage, please check the size of your cage carefully to see whether the size matches or not. Materials made from safe, non-toxic materials, all dyes are non-toxic and safe for your birds. Material: Plastic/Cotton/Metal；Size: Length 250cm/ 98.4Inch(when it is straightened); Diameter: 3.0 cm / 1.18 inch. The steel wire is durable and flexible, you can bend it into square, triangle, pentagon, trapezoid, rectangular, circular etc. Colorful rope bungee bird toy, it can serve as climbing rope, spiral toys and a parrot perch on the cage bars when it is straighten. A small bell is installed at the end of the string, enough to arouse the curiosity of your pet birds. With quick link fastener for easy attachment to cage. ATTENTION: If you want to put this toy into a cage, please check the size of your cage carefully to see whether the size matches or not. If you have any questions about this product by etrech, contact us by completing and submitting the form below. If you are looking for a specif part number, please include it with your message.